Aviation regulator Directorate General of Civil Aviation has blamed error on part of the pilots for the near-crash of Congress president Rahul Gandhi's chartered plane at Hubli in North Karnataka earlier four months back. On April 26, the 10-seater plane carrying Gandhi suddenly tilted heavily on the left side and the altitude dipped steeply with violent shuddering of the aircraft body before landing at the Hubli airport in north Karnataka. Besides Gandhi, there were four other passengers, two pilots, one cabin crew and one engineer when the incident took place, according to the DGCA. The incident, which took place during the campaigning for the assembly polls in the state, had triggered a political uproar, with the Congress alleging an 'intentional tampering' with Falcon 2000 private jet. The party had demanded a probe into the 'suspicious and faulty performance' of the aircraft. Civil Aviation Minister Suresh Prabhu had then ordered a detailed probe into the incident. In its report made public on Friday, the DGCA said, '(the) Crew initiated action only when the master cautions warning i.e after 15 seconds of autopilot disengage'. Such a warning appears in the form of a red light and audio warning in the cockpit for the pilot to take action and avoid in the split second any mishap. 'Due to lack of institutional awareness, the crew actions to control of the aircraft manually were slightly delayed,' the two-member panel said in its report. The panel recommended corrective training for the cockpit crew and a regulatory audit of the organization to check the compliance of regulations as part of its safety recommendations. Incidentally, the report, which was prepared on July 2, was made public on a day when Gandhi began his Kailash Mansarovar yatra, which he had announced as a thanksgiving after escaping death in the near-crash. The DGCA panel, in the report, ruled out any prior snag in the Ligare Aviation-operated aircraft, registered as VT- AVH. When the aircraft was at(41,000 feet), the commander requested Hyderabad ATC for direct routing to way point (BOGAT), the DGCA report said. 'At this time, the yaw damper (which is a device to reduce the rolling and yawing oscillations) failed, indication came on primary flight display and the auto pilot got disengaged. 'Both the pilots got busy in isolating the autopilot failure and did not realise that the aircraft has gone into right bank (steep turn). 'After 15 seconds of autopilot disengaged, the bank angle warning got activated that was the time when crew realized that the aircraft has gone into a bank,' the panel said in its report. According to the report, the commander took over control manually, by the time aircraft had gone into 'excessive bank' of around 65 degrees. 'During this time, aircraft had lost around 125ft from its cruising altitude. While the commander was in the process of controlling the bank angle, the aircraft continued to lose height by another 610ft in 9 seconds from the time when bank angle warning activated. 'Thereafter, the commander stabilized the aircraft and climbed back the aircraft to its assigned level of FL 410 (41,000 feet),' the report said. The Hyderabad ATC was monitoring VT-AVH on radar noticed descend of aircraft and immediately called up VT-AVH for reasons of descend. The PIC (pilot-in-Command) intimated that they had descended due technical reasons and later informed ATC that the autopilot had tripped, it said. 'When the aircraft banked to the right and descended, the PIC did not declare any emergency to Hyderabad Controller. The crew as per the procedure tried to reengage the autopilot however it did not happen.... The PIC thereafter flew the aircraft manually and got in touch with Hubli ATC at around 70 Nm,' the panel said in its report. After the incident, Gandhi's close aide Kaushal Vidyarthi, who was also travelling with him, had filed a complaint with local police besides writing to the Karnataka Director General of Police expressing concern over the series of events. Subsequently, the DGCA had set up the panel, with one member each from the safety and airworthiness wings, to investigate the incident. 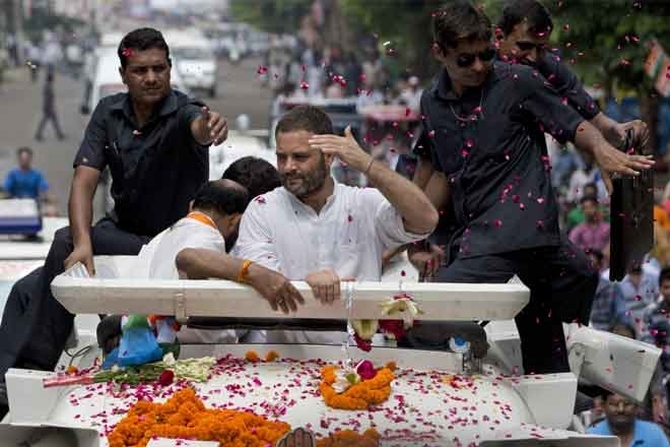 10 quotes by Rahul Gandhi that made one go Aha! Yes, Rahul can, and Rahul must!